As a suburban Philadelphia hotel situated in the affluent Main Line business corridor – equidistant from City Center and the airport in West Conshohocken – the Marriott Philadelphia West exceeds all expectations. Discover a host of all-new, in-room features, including Revive – the latest Marriott bed – featuring soft linens and down comforters. For events that call for sophisticated elegance, our Greater Philadelphia Marriott offers 10,000 square feet of newly renovated space – including a 4,900-square-foot Grand Ballroom. Experience the culinary delights of Shula’s 347 Grill restaurant, offering an a la carte menu for lunch and dinner, ample seating for 200, and two private dining options. This restaurant, named after the legendary Hall of Fame Coach Don Shula, features everything from gourmet salads to certified Shula Cut steaks, and serves a standard full-service Marriott breakfast. 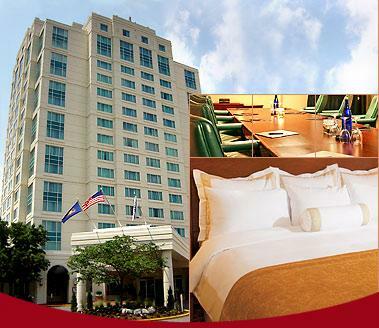 For business and pleasure in Southeastern Pennsylvania, our Marriott Philadelphia hotel is the ideal choice. Single or double occupancy rate is US $141 plus tax per night. This includes free high-speed internet access and free parking. Please use link below to get this preferred rate. Also if calling the Mariott directly, be sure to ask for the Group Reservation rate for the Philadelphia Cricket Festival. The hotel has said ‐ All reservations for all guests must be received on or before April 4, 2017 (the “cutoff date”). Reservations may be made directly at 800‐237‐3639, have guests calling in identify themselves as a part of the “Philadelphia International Cricket Festival Room” Block.